Here's the thread to discuss TBG's ITX buyer's guide using the SilverStone SG13 chassis. Hello, what would be the best build most similar to the current one but using an SAMSUNG 850 EVO 2.5" 250GB SATA III 3-D Vertical Internal SSD? I have already purchased the SSD, I also have an windows 10 key already. I would like to have a 1tb hard drive as well as an i5 7600k to reduce the cost of the build. The main reason I am asking is due to inexperience in building as well as part compatibility. You can easily make those changes to this build. The hard drive you should use is the HGST 1TB 2.5" drive. This is a laptop drive with the same dimensions as your SSD. They will fit side by side in the case. Your CPU choice of the Core i5-7600K is fine and will not affect the build process. I've been playing games on PC for a while now but ever since I've had heating problems with both my desktop rig and laptop, I've found myself wary of venturing into building my own system. Nevertheless, with me heading off to college next year I was more than thrilled to see this build pop up on my google suggestions and I'm excited to order the parts for it as soon as I can (oh college tuition woes). I did notice on amazon that the order time for the 1070 sc is 1-3 weeks whereas the 1070 sc black edition seems to be more readily available and about 10 bucks cheaper too. Would opting for the black edition cause any problems? Also, I'm most definitely having a roommate next year and was wondering how loud the system could get. I don't want to be that kid . Thanks in advance and big thanks for this build. Any chance of a video setup coming soon? Welcome to the TBG Forum, Nahid117! 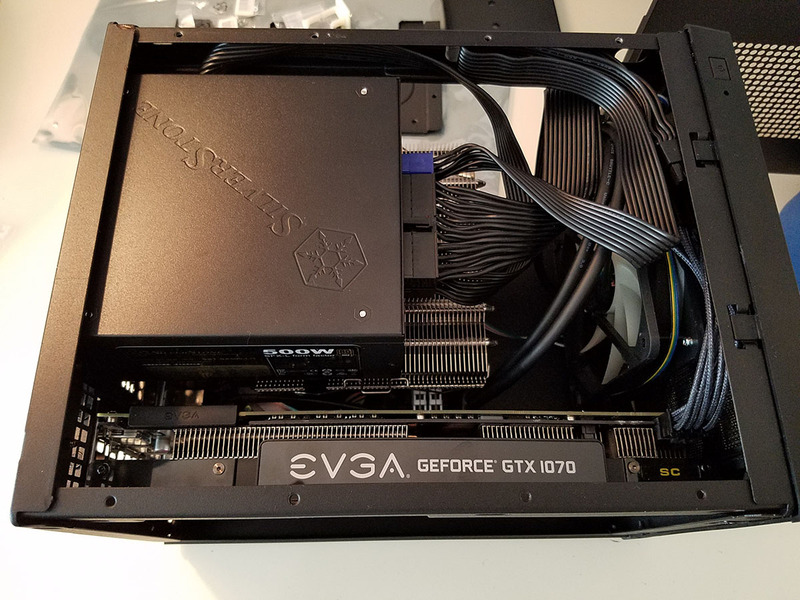 As it turns out, the original EVGA GTX 1070 SC is being replaced with the 1070 SC2, which is quite a bit more expensive. Your best bet is to go with the Black Edition, which will work just as well in this system. The biggest difference is that the Black Edition doesn't have a backplate, but that's a cosmetic difference, and you wouldn't see it in this build anyway! There won't be a video guide for this build, but in case you haven't seen it, there is a pictorial guide right here. By the way, this build is really quiet. I don't think you'll be bothering anyone with it. In fact, people will be amazed that you could fit so much power into such a small box! Sounds great! Thanks for the speedy responses on this thread. 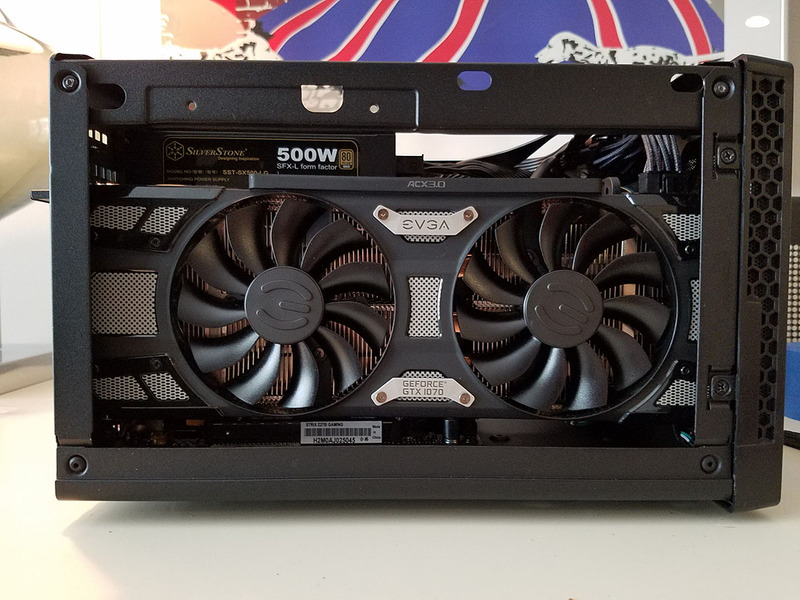 I did have another question about upgrading, specifically the GPU considering the limited space of the case. Would it be feasible to move over to something like a 1080 in the near future for this build. 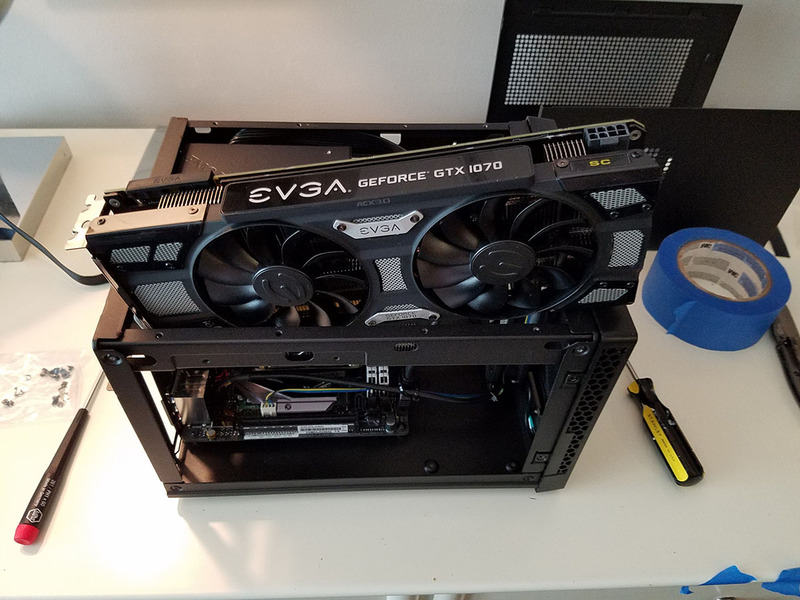 I think I read somewhere on the $1200 ITX build about fitting in an MSI gtx 1070 which I believe you mentioned would not fit in this case. Does that mean that the $1200 build is perhaps a bit easier to deal with in terms of upgrades due to the extra wiggle room? Having benchmarked both the SilverStone SG13 and the SilverStone RVZ02, I can tell you that the SG13 is the better overall choice for a high-performance video card. The catch is that there are only two GTX 1080 models that will fit: the GTX 1080 Founders Edition and the EVGA GTX 1080 SC. The RVZ02 really can't fit all that many others - the Gigabyte GTX 1080 G1 is likely the only additional option worth considering, as the MSI and Asus models are not good fits. In the end, you can just pick the form factor you like, and then pick the few GTX 1080 cards that will fit, but overall, the SG13 offers better performance due to its ability to mount a front fan and its better GPU ventilation. Thanks for the guide, thought I'd document my process of following along. I appreciate you putting this together, also that you did find the best prices. I compared everything to newegg, but went with your links to give you the buy through since they were all = or better! There was a delay on the graphics card of 2-4 weeks but I thought meh just wait, and ship the rest slowly. Then it ends up shipping after only 2 days! Well, all good. 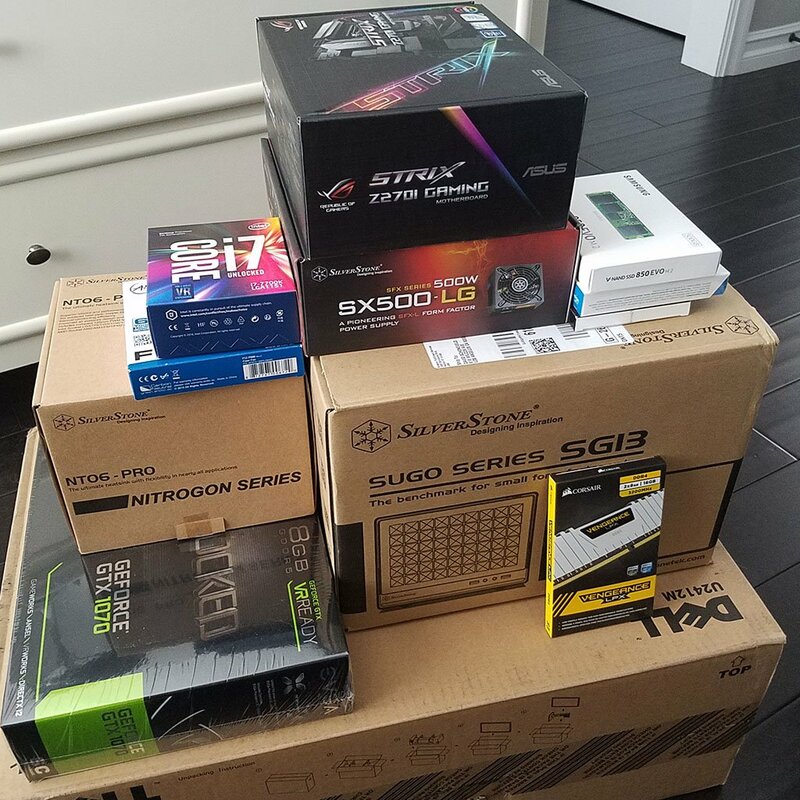 Time to start building! Can't wait to see how this turns out! Those boxes look good already, but when all that gear is installed in the tiny SG13 case, it's going to be even more impressive! Turned out great, with only 1 caveat. SilverStone 500W SFX-L Fan makes a ticking sound, way too loud. When mounted facing up it's quiet, fan facing down loud tic-tic-tic. A lot of low reviews mentioned that same issue. Right now I mounted the fan facing up, which is fine. Maybe not as ideal but not all that bad either. Foundation in place. No surprises except that remember to put the heat sink back plate in before screwing it down. And the screws for the Mobo are the tighter thread screws. Screws aren't marked in the instructions, lucky we're not idiots but still, takes a extra care to separate the right screws. 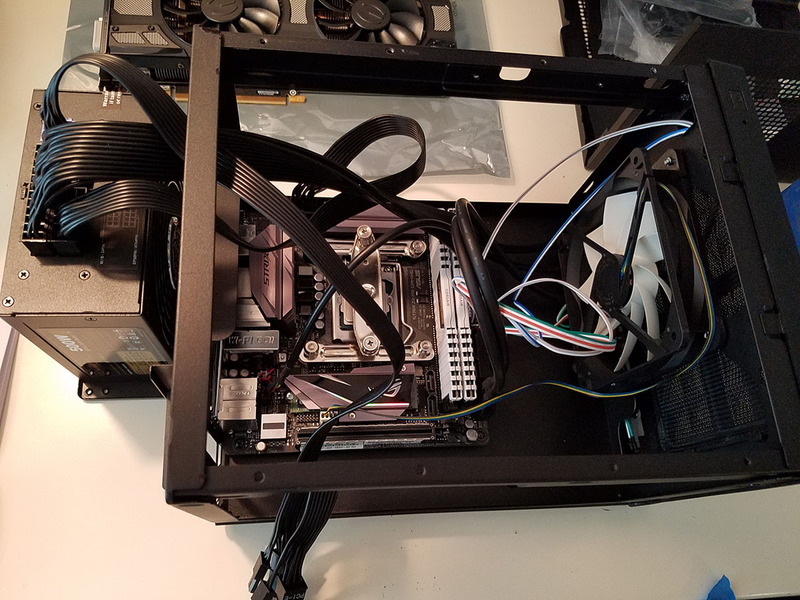 I wanted to get everything wired before the actual mounting of the heat sink for obvious reasons, hard to get around in there once its in place. Tidy'ed up the few case wires. The USB 3.0 wires are really inflexible and there's not a lot you can do with them, but I don't want them just floating around so just zipped them to the fan. Another tiny gotcha, no where does it say which direction the heat sink fan goes. Normally fans have the arrow either on the outside or inside walls. Not this fan. I googled images of it and saw in one that the "back" side or the side with the plastic supports crossing it goes against the radiator. Went with the center pea heat compound method. Like you said there's room. This is before I rotated the power to be fan up. here I was amused with myself for being so focused on everything else I thought oh put this in at the end. Nope, have to take the front off. No big deal just funny when the case is as small as this, you kinda forget. I don't do much with the power cable wires b/c if I have to get back in there they are the first to need moving. Tried to put them in cleanly and watch for which one need to overlap each other to be the best placement. Yay done, and its running smooth. Super quiet not that I got the power supply fixed. Posted the images to a gallery and a link back here http://imgur.com/gallery/pPJmI with the short short version of this post. Oh other thing I spent a lot of time trying to get the heat sink to work rotated 90° so the front fan would blow optimally across the blades, but like you knew. Its just not going to work. It looks like it will almost work early on, but not with the card in place. That was the only other "argh", but since I'm not trying to make an OC machine, it'll be fine I image. The issue with the SX500 that you read about relates to a voltage problem with the zero fan mode, causing a ticking sound. I actually discovered that years ago and stopped recommending the model until version 2 came out. Ironically I just sent my early SX500 in for RMA yesterday. Will confirm whether ver 2 replacement is quiet or not. Running with fan facing down shouldn't cause a problem, but I'll test this too. 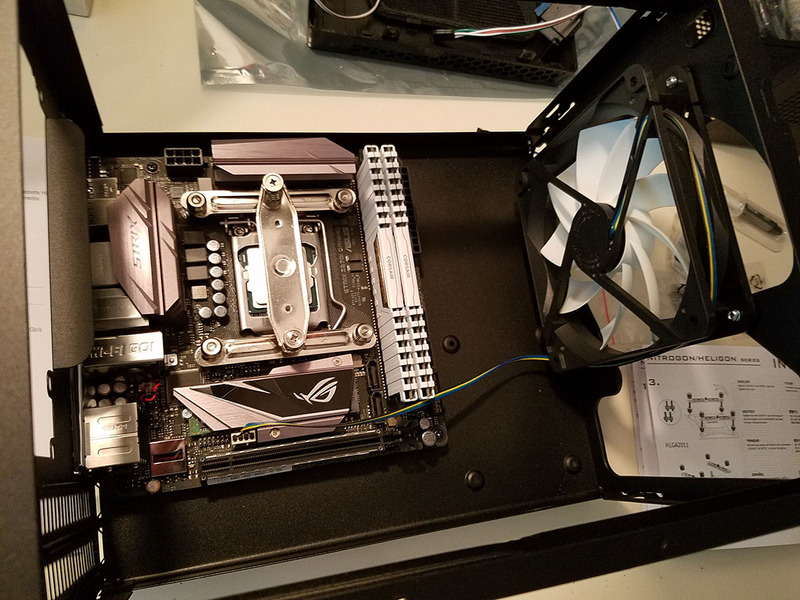 Note that all case and CPU fans intake through the open side, exhaust through the frame side. That's a universal rule, but Silverstone still should have provided better instructions. 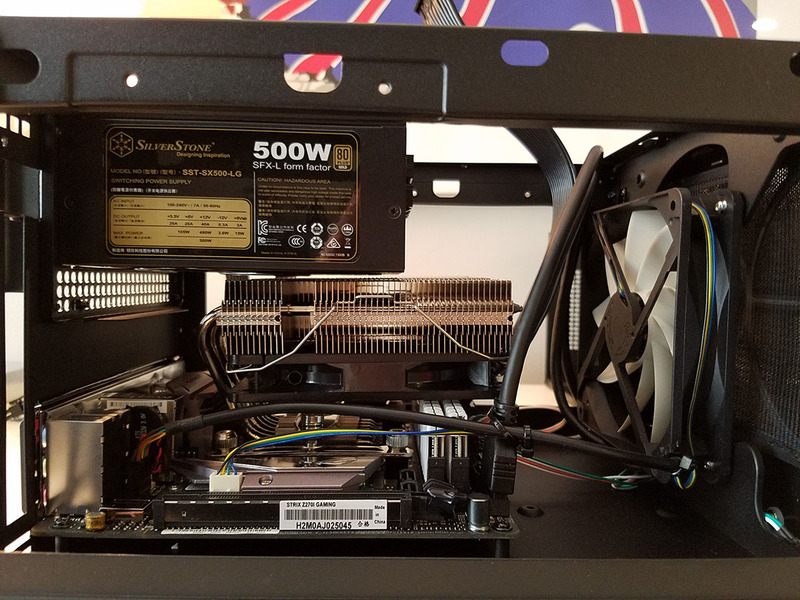 Follow up request - is it OK if I merge this with the Extreme ITX Guide thread so more readers can see your great photos and build suggestions? Sure, use them as you like. Your guide was super helpful to me. And I appreciate you supporting people with their issues. 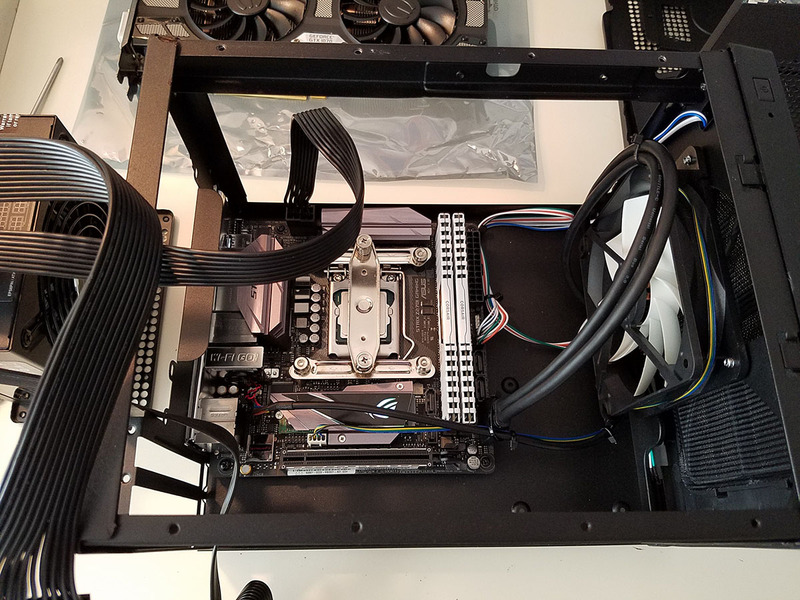 I only build a PC every 4 years-ish and every 2 years simple upgrades that are plug-in play so its always great having someone do the leg work of making sure things fit and are compatible. 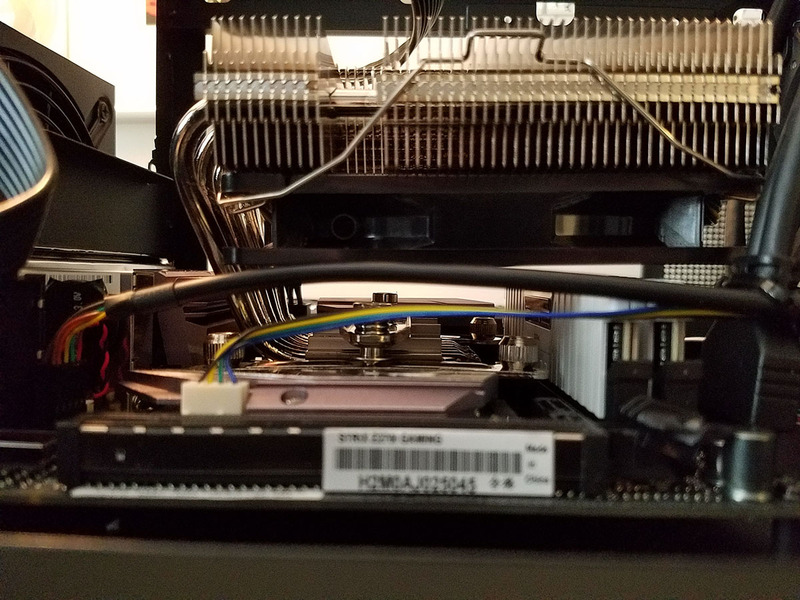 I had a build where the heat sink didn't fit and its not something I even looked at when buying "Of course it will fit" hah not always. Or RAM thats not optimal for a Mobo... its the small things you forget and having a builder keep an eye out is great. I didn't even know what M2 was until I read up on it b/c it was in your list. So thanks again! Glad to hear the guide was helpful. The goal was to provide inspiration for an optimized build and assurance it would actually work! I'm going to reach out to my Silverstone contact to see if your SX500 problem might be worth an exchange or if it's a common issue. Most PSUs today are designed to be operated both fan up and fan down. Silverstone reported back that they tested an in-house SX500 in all orientations and it made no ticking sounds. Silverstone recommends an exchange or RMA.